While domain names started as merely a utilitarian addressing system, they're now expected to simultaneously act like addresses, trademarks, commodities, collectibles, real estate, marketing gimmicks, and vanity license plates. As a result, conflicts have developed as various companies claim that others' domain names infringe on their trademarks. These have been resolved (or not) in a number of ways, including court cases as well as through domain dispute policies of the past and present -- beginning with the Network Solutions policy and culminating in the current ICANN arbitration. How Network Solutions attempted to resolve domain disputes, or rather cover their own butts when others sued over them, before ICANN came along with its dispute policy. 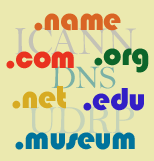 Since 2000, the primary means of resolving domain disputes has been the ICANN arbitration system, via the UDRP and other challenge policies. Has it been fair or biased? Country code domains sometimes use the ICANN procedures but sometimes go on their own in resolving disputes. Despite the dispute resolution procedures, some complainants have chosen to go to court instead, or have gone to court to overturn an arbitration decision they disliked. Conflicts relating to domains that don't fit neatly into any of the other categories here. Some information that may help you survive a domain challenge, including some defensive things to do before you get challenged.